HIF is one of Australia’s older health funds that was formed in 1954 in Western Australia. The company remains Perth based but offer national coverage and a range of products including overseas visitor health insurance. What Are The Main Features Of HIF’s Overseas Visitor Health Insurance? HIF has one of the lowest policy prices across their overseas visitor health insurance range. The below screenshot of our overseas visitor health cover comparison table shows how HIF has a competitive price within the overseas visitor health cover sector. A further 4% discount is available for those who choose to pay their premium annually. HIF is able to provide the lowest price because unlike most of their competitors they are ‘not for profit’. This means the company doesn’t have shareholders to pay dividends to so any profits are reinvested to improve policies or reduce prices. HIF have one of the strongest customer reviews of the health funds in Australia on the leading Australian review website – product review. You can see live HIF reviews from current/past at the bottom of the pages but it should be noted that many of these will be for their permanent health cover policies not their specialise overseas visitor health insurance plans. HIF is one of the only health fund to offer overseas visitors different levels of both hospital and extra’s cover. Generally, hospital cover is the policy that covers you if your sick or injured and need to see a doctor, hospital etc. Extra’s on the other hand cover the items you may more commonly claim on such as seeing a dentist, getting new glasses or visiting a physiotherapist. Most other health funds only provide extra’s cover on their more premium policies whereas HIF allows you to add extras cover to any overseas visitor health cover policy and you can also choose the level of extras cover level. Most overseas visitor health insurance policies have an excess or co-payments if you’re admitted to a hospital. This means that you will be out-of-pocket for the first $x or need to pay a certain amount per day during your stay. HIF has a $0 excess on their policy. This means that you won’t be out-of-pocket when visiting a hospital as long as you follow their guidelines on where and how you are treated. What Other Elements Should I Know? 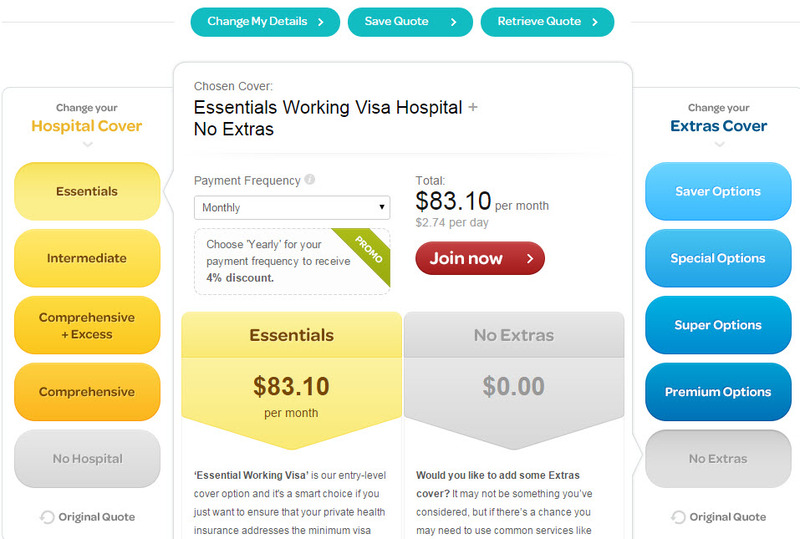 To keep their overseas visitor health cover prices low their essentials cover only covers public hospital stays. You also don’t get to choose to have a private room during your stay unless you purchase one of HIF’s more premium policies for overseas visitors. Most working visa’s such as the 457 visa have condition 8501 which requires policy holders to have “adequate health insurance”. All of HIF’s policies meet this ‘”adequate health insurance” requirement and a letter is sent to policy holders of proof of purchase which is required when applying for a working visa. Unlike most other overseas visitor health cover funds, HIF has age restrictions with anyone over 60 years of age being unable to purchase their low cost policies. Those above this age range still can purchase a HIF overseas visitor health cover policy but the prices are higher then the standard policy prices advertised. It is assumed this is the case due to this older age bracket being more likely to make claims which may place pressure on policy prices. HIF is rated 3.3 stars by 51 customers.